Immersive theater doesn’t do opera singers many favors. Like a photonegative of theatre in the round, it forces performers into an up-close-and-personal relationship with their audience and breaks down the fourth wall, lending most spectators an HD view of everyone’s tonsils. Singing technique, usually kept at a safe distance onstage, is here made loudly, oppressively available. Audiences at immersive productions don’t usually fare much better. For those watching, I can report firsthand, there is this constant need to be “on”: to be (or at least appear to be) fully engaged all times, to laugh encouragingly at all the funny bits since the actor’s standing right next to you, to transmit “rapt and studious” even if your every bead of sweat is discernible beneath the stage lights and you’d frankly rather look down. Sometimes it’s nice to be able to scratch your, uh, knee in peace. What can at first seem a radical gesture in new staging can quickly devolve into people-watching, as opera-goers are made as digressively aware of each other as they are of the folks in wigs and stage makeup. Since it was launched in 2012, spry opera company On Site has made such immersive theater experiences its calling card, staging unusual and underperformed works in nontraditional locales around the city and daring audiences to sit smack in the middle of the action. Sometimes it works. Reviewers marveled at the location selected for John Musto’s Rhoda and the Fossil Hunt last September—The Hall of Saurischian Dinosaurs at The American Museum of Natural History. But often, it doesn’t at all. I remember my trip last summer to The Garage, a joyless warehouse space located just off the Westside Highway, to hear a rare, unfocused production of Milhaud’s La Mère Couple. Audiences emerged with stiff necks (from the constant craning to catch all the action) and sore asses (courtesy an assortment of folding chairs that must’ve come wholesale from Guantanamo Bay), and I left feeling more fuddy-duddy and fist-shakingly vexed than usual, and trust that I can get really fuddy-duddy sometimes. 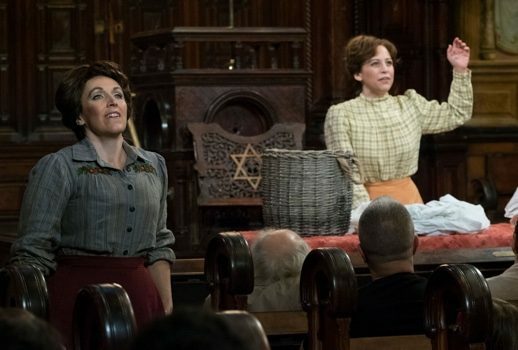 On Site is learning, though: for its latest outing, the second-ever production of composer Ricky Ian Gordon’s operatic musical Morning Star, which debuted on Wednesday in a blizzard and holds its final performances Sunday, visitors to the Eldridge Street Synagogue in Chinatown could fork over $5 for rental cushions. The sold-out production commemorates the 107th anniversary of the 1911 Triangle Shirtwaist Factory fire, New York City’s deadliest workplace disaster until September 11, 2001. It also, in one show, spotlights several of immersive opera’s most and least appealing features: we get to go on a lot of squirmy one-on-one dates with each individual singer, but along the way score front-row seats to some of the best individual performances I’ve encountered all season. Despite the opera’s press notes and suggestive location, the Triangle fire, which overtook the 8th, 9th and 10th floors of the ill-equipped Asch Building in Greenwich Village and killed nearly 150 mostly female employees, in fact proves somewhat incidental to the story, at least until its almost unbearable final scenes. Much of the plot instead revolves around the everyday domestic dilemmas of a working-class Jewish family living around that time. An immigrant family from Latvia—three girls and their mother, a widow—are forced to confront some difficult truths about their past as well as personal and political frictions among family members who’ve chosen not just different, but conflicting career paths for themselves. Much of the action is structured around household scenes, but the plot is none the lighter because of it. Wedlock, betrayal, sibling rivalry, feminism, and union strikes give the opera much of its driving thematic material. Yet despite its gravitas, the work also feels true to the times. Of course, for all of this to work, performances must capture the genre’s more mannered conventions while honoring the seriousness of the source material. Luckily, performances—from leads to ensemble—accomplished both these things last night, and were roundly well sung and well acted. As Becky Felderman, the matriarch of the family, soprano Emily Pulley captured the fragile tenaciousness of a woman who left everything behind in Riga for a new life in New York. Mezzo Blythe Gaissert breathed believable, dramatic fire (real tears, people!) into the role of eldest daughter Sadie, an angry capitalist who won’t bow to union pressures. Cree Carrico supplied an attractive and even soprano to the role of youngest daughter Esther. And in an especially stunning turn, Broadway and opera actress Jennifer Zetlan gave glorious, ringing sound to the role of middle daughter Fanny Felderman. I’d hear Zetlan in anything. The cast’s supporting men played equally well, with baritone Joshua Jeremiah delivering a radiant performance as family friend and union-sympathizer Aaron Green, Blake Friedman lending a bright and easy tenor to the role of composer Irving Tashman, and fine-looking baritone Andrew Lovato as the educator who enchants several siblings at once. Built in 1887, the historic synagogue on Eldridge Street certainly provides On Site’s general and artistic director Eric Einhorn with some unique staging challenges: the sanctuary space throws the audience in the middle of everything while relegating the orchestra uncomfortably to the rear. But the space is indeed a stunner, all gothic candelabra and stained glass, and Einhorn endows the production with some impressive displays, all meant to suggest the nearness of tragedy. In the opening scenes, caskets become dining room tables; a cantor’s rostrum becomes a piano. And while I won’t give away the fire’s staging, I will say it’s tremendously effective, which is to say awful. Regular On Site conductor Geoffrey McDonald worked closely with the composer to pare down his orchestrations for the production, and whipped up some reliable, if a bit remote, sounds from his musicians. Those sitting near the front of the sanctuary often had to use their creative imaginations to balance the up-close singing and the faraway chamber orchestra—another design flaw, I suppose, of the immersive theater experience.